U.S. Senator Roger Wicker was the featured speaker at the UCDA annual dinner meeting. More than a hundred people attended the annual dinner meeting of the Union County Development Association (UCDA), Monday night, April 30. 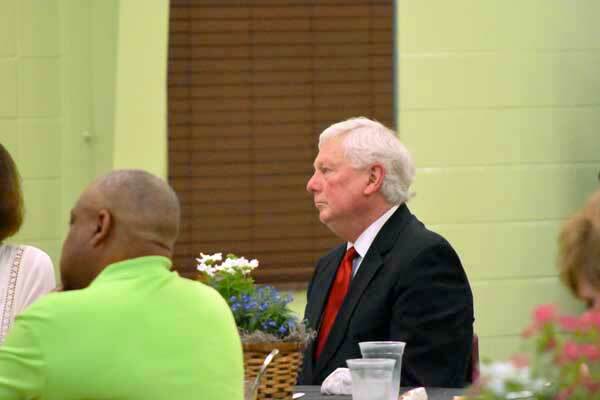 U. S. Senator Roger Wicker was the guest speaker for the event held at the cafeteria of New Albany Middle School. Wicker, who has many long-time friends in New Albany, recalled several events from his youth until the present time that connect him with people here. The Wicker family was originally from Hickory Flat, but Senator Wicker grew up in Pontotoc. He told how that came about: His father, Judge Fred Wicker, served in World War II and finished law school after the war was over. He said Fred Wicker, fresh out of law school, wanted to practice law in New Albany, and came to New Albany to discuss the prospects with the late Hugh Clayton, a distinguished lawyer and later president of the Mississippi Bar Association. Clayton essentially told young Fred Wicker, “We don’t need any lawyers in New Albany, but they need lawyers in Pontotoc County.” And thus it was. Baptist Union County Administrator, Walter Grace, was honored for his service as UCDA President. Wicker represented Mississippi’s 1st Congressional District in the House of Representatives from 1995 to 2007 and has served in the U.S. Senate since 2007. The late John David Pennebaker, who died in March 2016, was honored posthumously as Citizen of the Year. He was a practicing attorney who represented Union County in the state legislature, served as Mayor of New Albany and served as Union County Chancery Clerk. The award was accepted by Gwyn Pennebaker, his widow, and was presented by Dr. Tommy Barkley. The Wal-Mart Distribution Center was named the Business of the Year. Walter Grace, administrator of Baptist Memorial Hospital – Union County, was honored for his years of service as president of the UCDA. U.S. Senator Roger Wicker, speaking at UCDA annual meeting.